Zeeland is a province of The Netherlands, it's the bit in the south west with lots of peninsulas and islands. Zeeland means sea land so it's the bit where the sea meets the land. Genius. As such it's the holiday destination of choice for the Dutch and apparently many Germans too. Think of it as Cornwall for the Dutch. 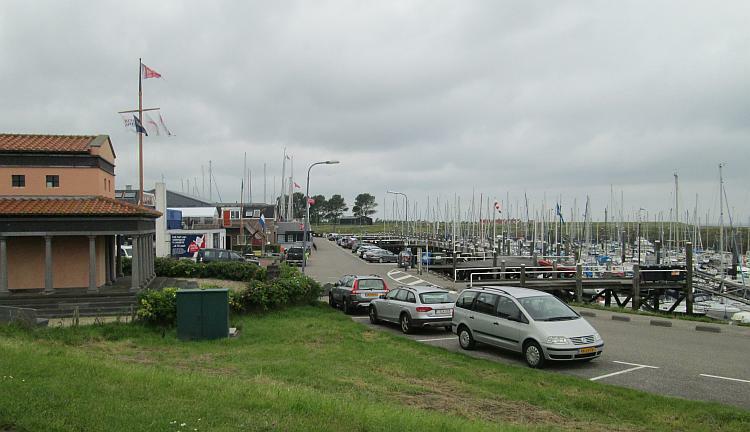 We're camped near Kortgene which is not by The North Sea but along the shores of Veerse Meer. What? The Dutch have been messing around with their dykes and their damns and their drainage for aeons so the stretch of water I'm looking across this morning was *probably* part of The North Sea once or at least a river mouth but now is protected and isolated by dykes from what I can work out on the maps. I can actually see it this morning because yesterday's rain has stopped and there is sunshine struggling through the clouds here and there. The forecast is mixed, some rain, lots of cloud, maybe a hint of sun. I stand in the common room with the patio doors open looking over the waters as the occasional boat saunters by. Our gear is almost dry, I've checked the bikes over and they're surviving and Sharon's slowly dragging herself out of bed. We've nothing specific to do today so I'm quite chilled but running close to getting bored. This ain't a bad start to the day is it. We set out in sunshine then sure enough a light rain starts so we put on the waterproofs, oh well. We wander across the vast open farmland and along the roads and lanes and fall purely by accident into Colijnsplaat. I'm unsure how it's pronounced it but we like "Colin-Splat". There's a marina, a very small town and a Spar store where we purchase a bite to eat. Colin Splat harbour, the rain has abated for now. Domburg is a larger town with a beach on The North Sea. While the rain has stopped the clouds are heavy yet as we approach the beach I'm reminded of Newquay in Cornwall. They're not twins, not at all but I'm feeling that same vibe of sea, seaside, surf, ice creams, cafes, bluffs, holidays, wet suits, cheap dinghies and seagulls. The beach is quiet due to the weather which means the shops and restaurants are filled. If the sun did come out and the surf rose up then yeah, Cornwall. Oh no, hang on, flat Cornwall. Cafes, lifeguards, sand and sea in the south west of a country. No pasties though. No surf and little sun today. A splendid and clean beach though. Doing the Dutch thing I throw the bike into the side of what looks like a walkway on top of the dyke that leads to the beach. Sharon disappears to make use of the toilets and as I sit on a bench a police bike rides up the path, makes a loop, stops to look around then looks at my motorcycle. Briefly. He then looks around some more and rides away. I was at least expecting a polite "move ya bike" if not a ticket and a fine. Nope, he barely even noticed my bike. I wonder if things might have been different if it was a 1000cc tarmac shredder. I guess I'll never know. Bicycles are everywhere, even at the beach. There's a couple more small towns we pass through heading west then south along the coast, they're nice enough but there's nothing really to report. Vlissingen and Middleburg sort of merge into one another to form a small city or a large town, nothing really to report. The last hope of interest is Veere. Dutch style I park the bike in the bicycle parking spaces this time. Like Edam Veere is big enough to be interesting but small enough to avoid being a hustle and bustle place. The harbour is lovely with big Dutch houses just as you'd see them in brochures. The church is austere and solid while the town hall is grand, showy and flamboyant. Some buildings look old but being Dutch they're all in excellent repair. Cafes spill out onto the weed free block paved roads (or footpaths, you can never tell). Veere offers The Netherlands just as we're told to expect it, and it's lovely. The town hall's tower is just show-boating and showing off. We spend an hour walking around then sit a while on a bench on the dyke looking across the waters to "Schotsman" and "Rancho Grande". I laugh as I conjure up an image of a kilt wearing sunburnt ginger Scotsman entering a dusty wild west ranch. At least the tablet's map app is working now the rain has stopped. This is easy. I'm liking this. I like Veere too. I'd be totally relaxed save for the fact I keep on looking back at the bike, fearing a traffic warden or policeman will stop to put a ticket on it. No-one does, the locals don't even bat an eyelid and while we're there several youths park their mopeds as they come and go. Different country, different attitude. That evening as the sun drifts lower in the sky we walk around the Zandkreek campsite. What looked as bleak as a shipwreck in the misery of the storm turns out to be a peaceful simple campsite set by the water's edge. The most remarkable thing to note are countless empty and broken crab shells along the concrete flags that form a path by the shore. We soon work out the local seagulls use the hard flags to smash the poor crabs open before devouring them. From a crab's perspective this is like the scene form a horror movie. We on the other hand are happy to enjoy the cool evening air and a little light exercise before bed.